A deep dive into the COS way of stylin' and livin'. To spread your reach, expansion is a must. But to do so, you'll need to account for quality maintenance in its growth. That's what Swedish retailer COS did with their latest store in Marina Bay Sands (fans of the brand's signature minimalist garments may commence ecstatic screaming). We got Christophe Copin, head of menswear for COS, to talk about the brand—from the inception of his design career to COS' take on the notion of gender-neutral dressing. ESQ: How did uniforms and the use of clothing to express different narratives that help spark an interest in fashion design? Christophe Copin: I had a great interest in buildings and architecture prior to studying Fashion Design. I first began studying Architecture in a school in France before changing paths—this remains a huge inspiration for me. You will see this throughout my work as well as that of the team at COS. Along with Art and Design, architecture inspires the construction of the garments we create, it’s such an important part of the design process—the patterns and the making, how each seam is finished and how the stitches hold a piece together. This led me to Fashion Design as it gave me the opportunity to take a different approach to each garment. 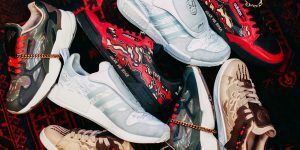 ESQ: What's the idea behind the spring/summer 2019 collection? Christophe Copin: The elements were a big inspiration for us this season and this can be seen throughout the collection. We looked at the different qualities of water and air and used this to inform silhouettes and fabrics—interesting textures are seen alongside luminous performance fabrics which are inspired by refractions of natural light. Water and air also influenced the colour palette, where a spectrum is used to complement tones of butter and stone, set against storm grey and deep brown. ESQ: One of my favourite things about COS is how the evolution from season to season starts with reworking the tiniest details, and its relationship with the wearer’s body like the Soma project at Pitti Uomo and the White Shirt Project… would you define that as COS core ethos? Christophe Copin: This idea of reworking pieces can be found throughout our collections and is a key element of the COS design process. For the spring/summer 2019 collection, classic pieces like the trench coat and the blazer are reworked using lightweight fabrics, which allow for fluid movements for everyday wear. 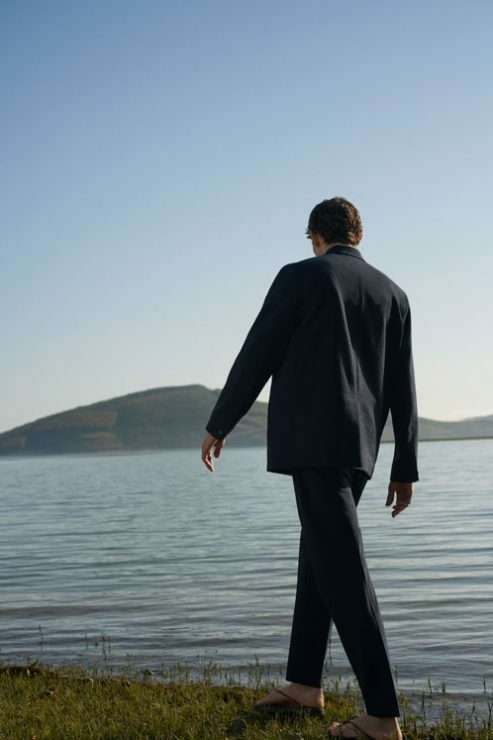 The unconscious everyday movements associated with menswear are key to understanding how clothes are worn, and formed the starting point for the Soma collection. We looked at the way each movement affects how the clothes sit on the body—the roll of a sleeve, the way a collar catches at the neck—and brought the collection to life through dance, using movement. Quintessential pieces such as the white shirt are reinvented season after season—its classic style enables us to focus on the true art of craftsmanship. For the White Shirt Project, we took the classic shirt, deconstructed it, and reinvented eight fresh styles in an innovative and functional way, allowing us to celebrate both traditional and contemporary design. ESQ: What are your thoughts on the current menswear landscape? Christophe Copin: The menswear landscape is exciting and ever-changing. As trends come and go, we remain true to our core values and continue to design modern yet timeless collections, creating our own seasonal directions inspired by Art and Design. We have, of course, noticed a greater interest in menswear as the collections and the general offering expands. There has also been a huge shift in what is widely considered as a masculine or feminine design, especially in the last few seasons—interestingly our customers shop fluidly throughout our stores and collections; this is something we encourage. ESQ: Where and how do you see COS menswear developing? 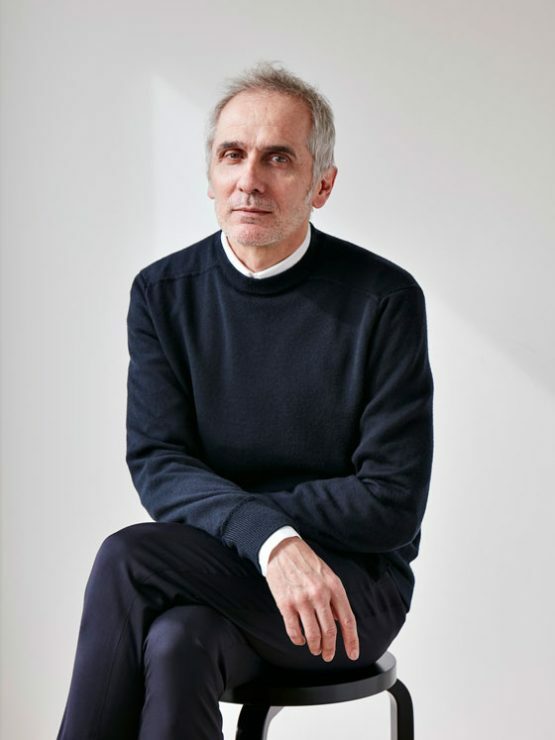 Christophe Copin: From our London headquarters, we are constantly striving to reinvent wardrobe staples and deliver the best possible quality in our design. Menswear is very important at COS, as mentioned, it is a category which is constantly changing and developing, and we are continually trying to find innovative ways to work. We design our menswear collections with our customers' needs in mind, making sure we understand how our clothes are worn day-to-day. We continue to offer classic wardrobe staples but each season, we research technical fabrics and spend a lot of time focusing on the silhouette, volume, colourways and sizing—I encourage people to have their own take on the designs and find their own way to style the garments. ESQ: Do you ever see COS doing away with the labels of gender, and just focusing on clothes for all? Christophe Copin: While there are currently no plans to remove physical labels, there is something about our creative process which is connected to modernity, functionality and tactility that speaks to both men and women, and many pieces throughout the collections can be worn by both genders as I mentioned earlier. We urge our customers to try pieces on and buy smaller or larger sizes where necessary, creating their own personal style. ESQ: What will the autumn/winter 2019 collect look like? 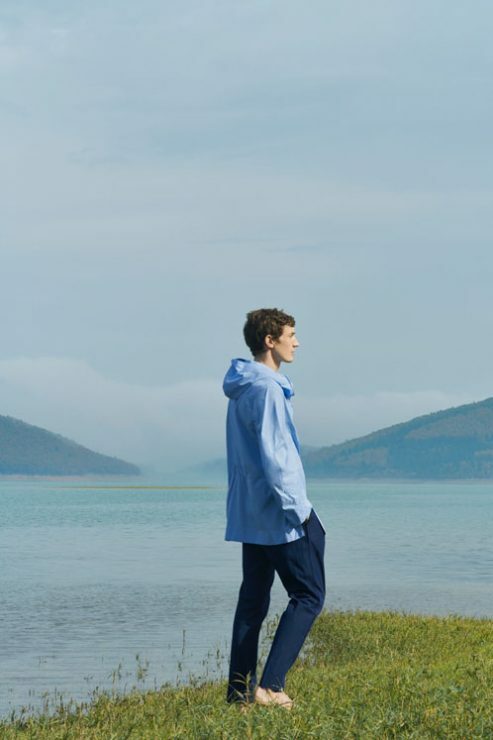 Christophe Copin: The autumn/winter 2019 collection explores two key concepts: a brutalist approach based on the strong, angular lines of architecture and a more tranquil direction drawing inspiration from nature. These concepts shown throughout the collection often drawing elements taken from the manmade and natural worlds and bringing them together. The season’s colour palette references the two key themes, using industrial greys and an array of softer shades such as stone and oatmeal, warmed by deep rust and plum. ESQ: You said that you don’t have rules for how someone should dress (which I personally think is amazing). But for a man who has never been to a COS store before, what would you recommend be the first garment that he tries on to experience this world that you and Karin Gustafsson (COS' creative director) have created? Christophe Copin: I prefer not to set rules for how people should dress—which is disappointing to hear for some! At COS, we certainly have a clear aesthetic, we are such a timeless brand, but we really want to focus on encouraging people to dress in any way that makes them feel great. 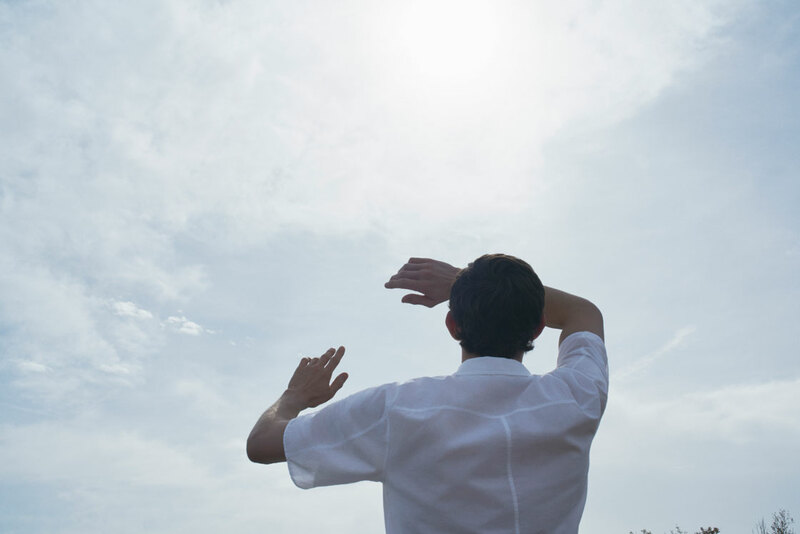 That being said, we always look back to the classic white shirt. With each collection, we reinvent the classic styles and introduce new forms with new design details. I suggest the wearer tries them on in different sizes, finding new fits and silhouettes. This season I would also highlight the double-breasted bonded linen trench coat, as well as the deconstructed blazer. ESQ: What would you like your design legacy to be? Christophe Copin: For more than 10 years now, COS has built high expectations in terms of its design, inspired by art and architecture. We work around four key building blocks ensuring pieces are timeless but also functional, modern and tactile. There is an incredible level of attention to detail, ensuring high-quality design and we hope to be considered as a brand that has the ability to stay relevant by staying true to our core design values whilst continually modernising.